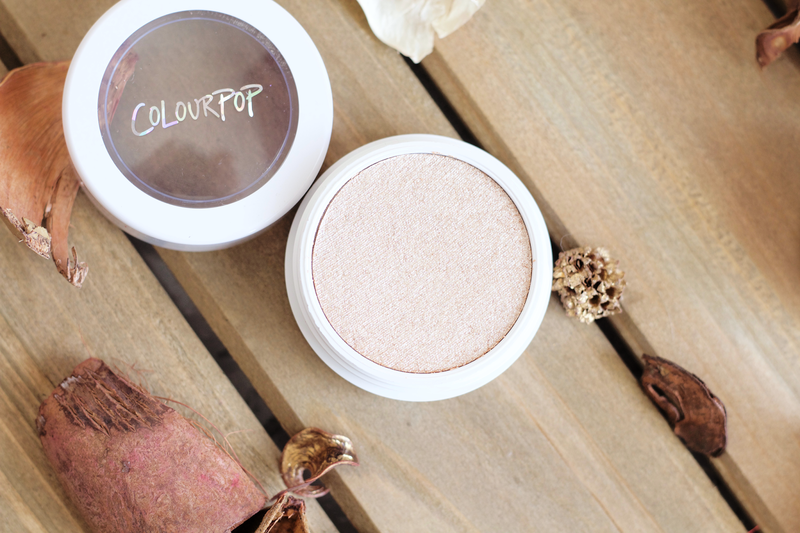 A few weeks ago I put in an order to ColourPop Cosmetics and picked up a few goodies from both their permanent line and Fall collection. 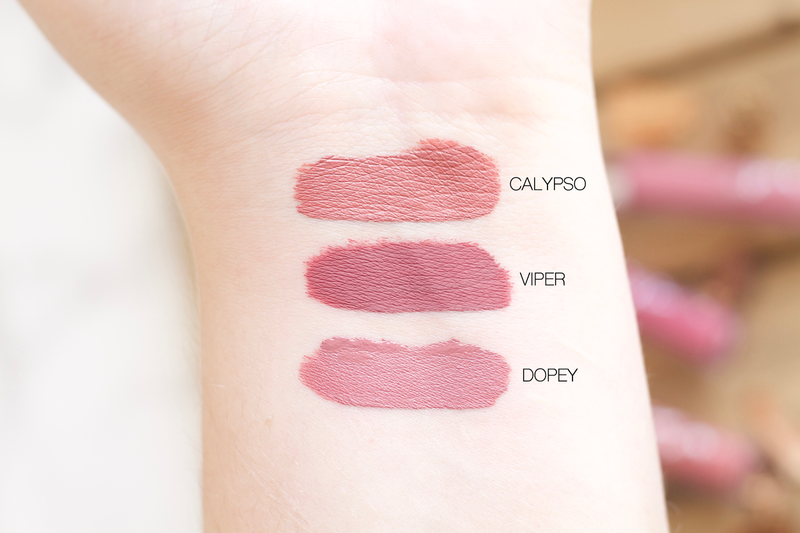 After looking at swatches, I ended up choosing these five products: Dopey Ultra Satin Lip, Viper Ultra Matte Lip, Calypso Ultra Satin Lip, Super Shock Cheek Highlighter in Flexitarian, and Super Shock Shadows in Muse and Brady. I didn't really have a theme when picking things but after looking on their Fall Edit page I really fell in love with these colors. Dopey was always a color that I wanted to get, so I threw that in there, too. I actually don't even remember the last time I did a ColourPop order! If I think about it, it may have been when Kathleen Lights did her first collection with them (I love Lumière Lippie Stix and Lumière Pencil!). Still, that's quite a bit ago. I've been apprehensive since then as I was not very impressed with my experience. The one thing that really turns me off from buying from them is their processing time. Luckily I don't live too far from their HQ and distribution center, so I get it really quickly once its shipped. The problem is their processing time still is pretty long. For international customers I can't begin to think how long it must take for things to get to you! I would be an avid buyer of ColourPop if they could make their processing much more efficient. But it is concerning seeing as this has been a problem even way back when they first started and it has not changed even though they are such a successful business now. I'm glad I ordered things again from them but I'm going to be selective when I choose to order again after my next purchase gets here. Flexitarian is a creamy, cool toned white-champagne color with a pearlized finish. Per their Super Shock Cheek products, it can be effectively picked up by using a synthetic brush, duo fiber brush, or your fingers. 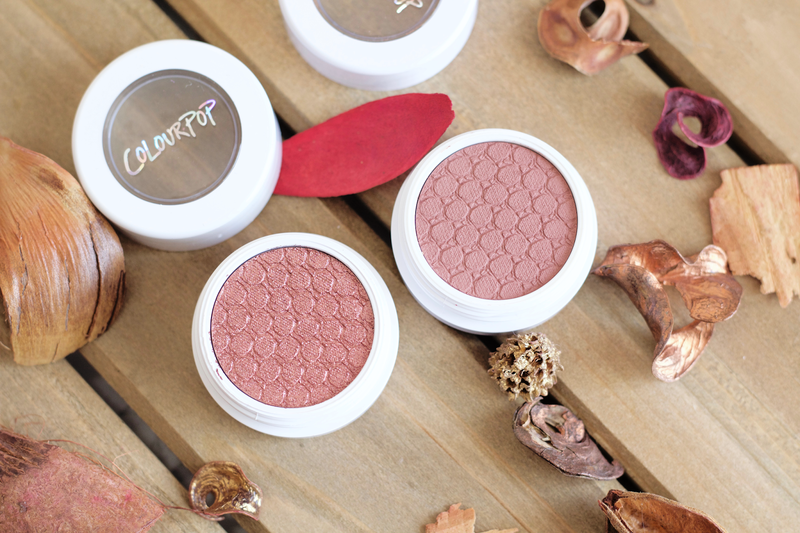 ColourPop's Super Shock Cheek products are a semi-cream to power formula, so they feel very soft under your fingers but turn into a powder when applied. They claim that they are long-wearing. 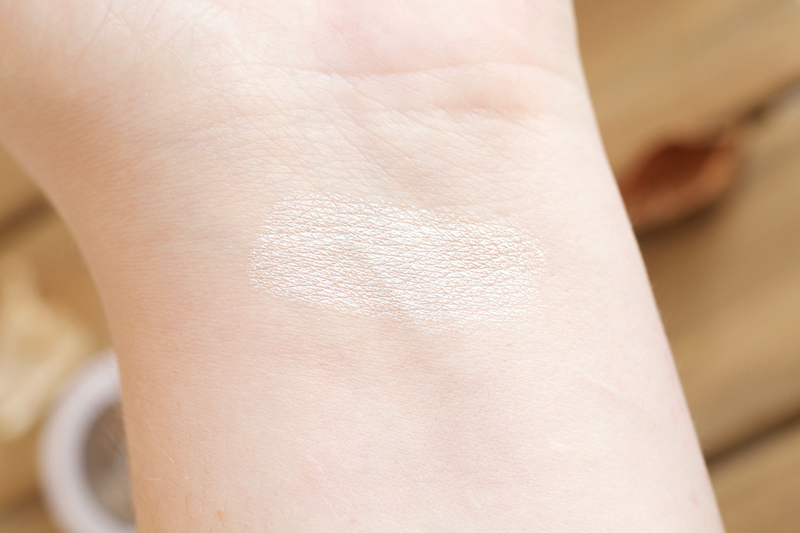 On my skin tone, Flexitarian looks like a light champagne with silver glitters mixed in. It does come off looking like a white-ish champagne color when the light hits it, which is my favorite when it comes to highlighters. It matches my cool toned skin so well. I'm not the biggest fan of having to use synthetic or duo fiber brushes, as I don't really own too many of those (thankfully own some from MAC I can use! ), and I prefer using my Wayne Goss 14 for highlighter application. However, I'll forsake that change for how beautiful this looks on the skin. I mostly have been using my finger to apply it and then after using my MAC 130 to spread it out (so it doesn't look like just a line on my face). I did find it to be long-wearing, even after 6 hours it still was hanging on (although not as strong due to my oily skin). I do have to say that this definitely is attention grabbing! This is not for the faint of heart nor for natural makeup days. 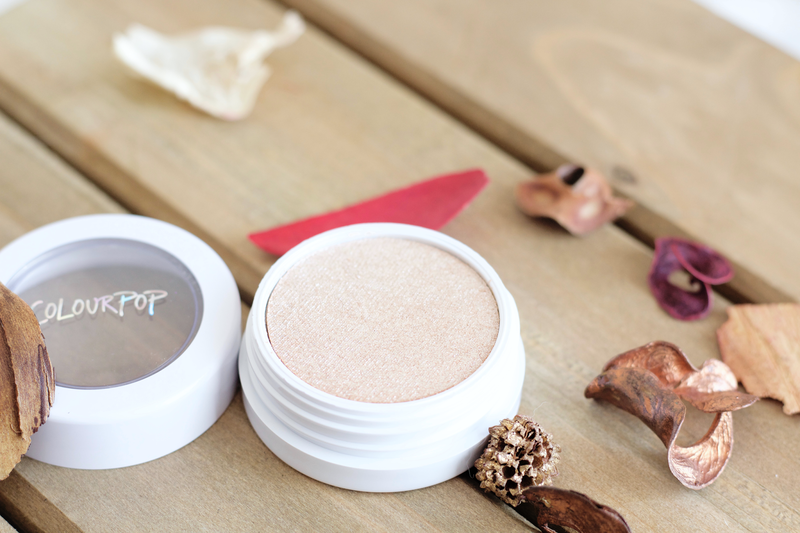 Your cheek bones are going to be soooo glowy. Give me the drama! I'd love to try another one of their highlighters. I'm thinking of getting Lunch Money (a golden duo chrome with a pearlized champagne finish). Ingredients: Dimethicone, Synthetic Fluorphlogopite, Isononyl Isononanoate, Alumina, Trimethylsiloxysilicate, Dimethicone Crosspolymer, Ethylhexyl Isononanoate, Isopropyl Myristate, Vinyl Dimethicone/methicone Silsesquioxane Crosspolymer, Phenoxyethanol, Tin Oxide, Stearalkonium Hectorite, Ethylhexylglycerin, Propylene Carbonate, Iron Oxides (Ci 77491), Mica (Ci 77019), Titanium Dioxide (Ci 77891). 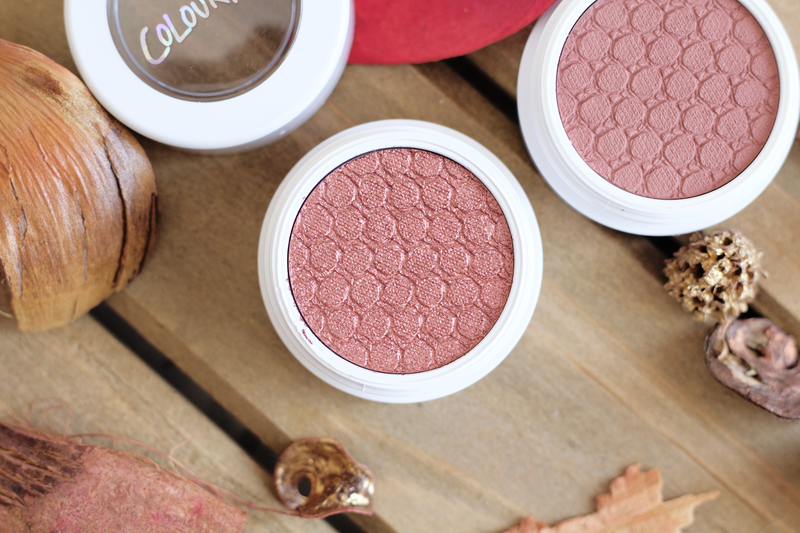 Super Shock Shadows in Muse and Brady are both part of ColourPop's Fall collection. 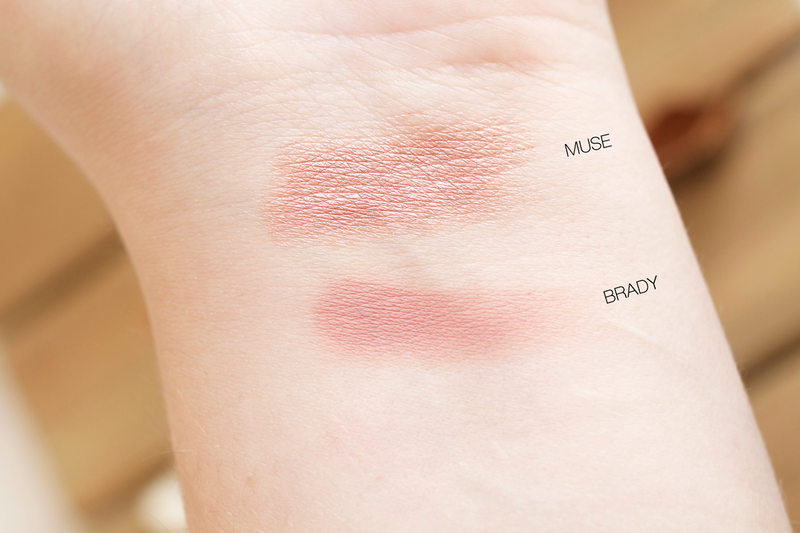 Brady is a matte dusty rose and Muse is a pearlized coppery rose. Both are a semi-cream to powder formula and have shown to produce no fallout. What I like about these shadows is that although ColourPop advises to use either your fingers or a synthetic brush, I've used squirrel hair and goat hair brushes with them and they've performed just great. Since I have hooded eyes, I don't really use my fingers to apply shadows as I don't have a lot of room to pat down. The difference in quality and longevity of these two shadows is not too big but just enough to notice. Since I've really been using Muse by spraying Fix+ on it first, I don't have a problem with it moving all over my crease. It just sticks in the spot I put it and I'm honestly not even concerned when it comes to shadows transferring onto my upper eye space. It's inevitable with how my eye shape and skin is overlapping my lid area. 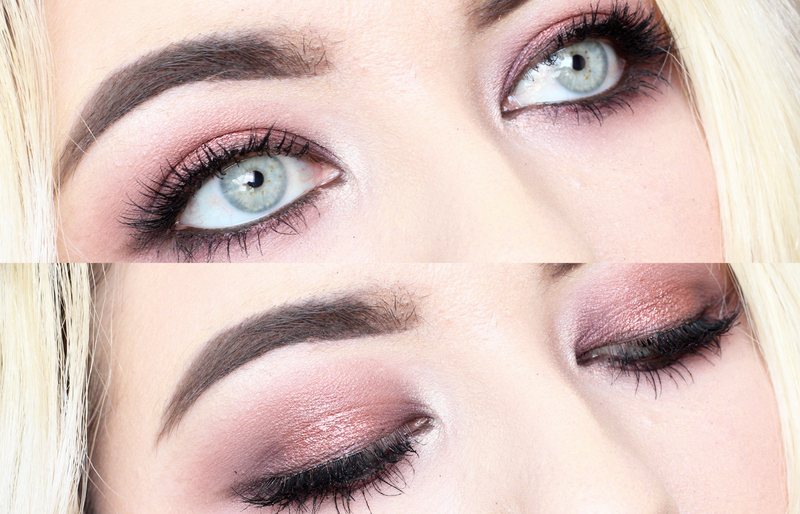 As you'll see in my eye look picture below, Muse slightly rises above the lid area and into the crease. I would recommend spraying Fix+ before applying Muse if you have hooded eyes because I didn't have any issue with it. Brady is a different case, as I did notice it lost its pigment the longer I wore it. It didn't completely disappear but I could tell it wasn't as vibrant compared to when I first applied it. I especially mention this since it has always been my gripe with ColourPop's matte eyeshadows and their lack of long-wear. However, it's not something to completely rule out their eyeshadows, as they are very soft and apply so nicely, but it's just information to keep in mind. I'm so happy I bought these two! They are two of my favorite eyeshadows at the moment, especially Brady (even with my criticism about it). I heard some negativity from people that Tang looks a lot like Brady, but Tang is a dusty plum color while Brady is a dusty rose. After looking at comparison swatches, I don't think they look alike at all and I'd also love to purchase Tang too. Ingredients (Muse): Cyclopentasiloxane, Dimethicone, Silica, Trimethylsiloxysilicate, Isododecane, Synthetic Fluorphlogopite, C30-45 Alkyl Cetearyl Dimethicone Crosspolymer, Cyclohexasiloxane, Boron Nitride, Dimethicone/vinyltrimethylsiloxysilicate Crosspolymer, Phenoxyethanol, Disteardimonium Hectorite, Glycine Soja (Soybean) Oil, Mangifera Indica (Mango) Seed Butter, Propylene Carbonate, Ethylhexylglycerin, Tin Oxide, Cucumis Sativus (Cucumber) Fruit Extract, Bronze Powder (Ci 77400), Iron Oxides (Ci 77491), Mica (Ci 77019), Titanium Dioxide (Ci 77891). Ingredients (Brady): Cyclopentasiloxane, Dimethicone, Trimethylsiloxysilicate, Isododecane, Boron Nitride, C30-45 Alkyl Cetearyl Dimethicone Crosspolymer, Bismuth Oxychloride (Ci 77163), Cyclohexasiloxane, Dimethicone/vinyltrimethylsiloxysilicate Crosspolymer, Phenoxyethanol, Disteardimonium Hectorite, Glycine Soja (Soybean) Oil, Mangifera Indica (Mango) Seed Butter, Propylene Carbonate, Ethylhexylglycerin, Cucumis Sativus (Cucumber) Fruit Extract, Carmine (Ci 75470), Iron Oxides (Ci 77491, Ci 77492, Ci 77499), Mica (Ci 77019), Titanium Dioxide (Ci 77891). I have been obsessed with wearing these three! The only liquid lipsticks I really have been wearing are from Kylie and Jouer Cosmetics since they are the most comfortable ones I own. Out of all three, Dopey is my favorite! It's the nicest, neutral dusty mauve and so complimentary on my skin tone. 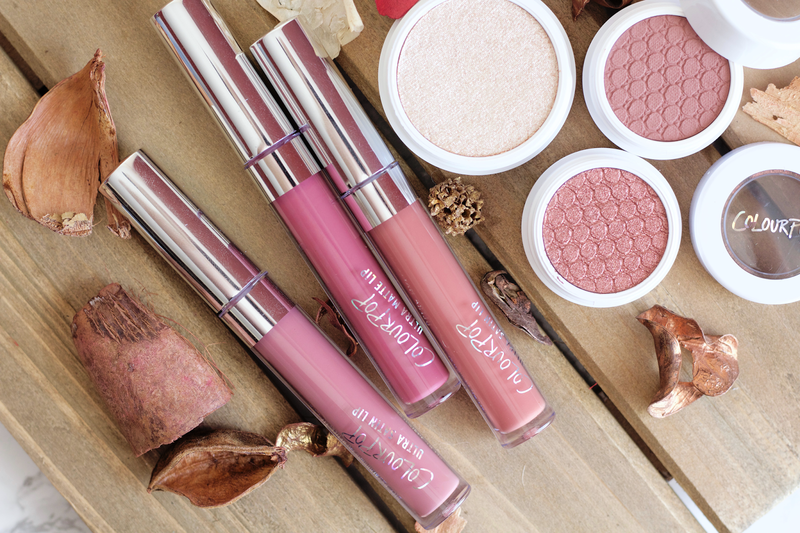 The Ultra Satin Lips are the most comfortable compared to the Ultra Matte Lips for me personally. Since I have such drying lips, I'm really picky about liquid lipstick products. It's why my collection has not only sized down but I rarely buy them and if I do I've researched it a lot to make sure it's what I want. Obviously that's changed since ColourPop has come back into my life! Out of the two, I've thoroughly been enjoying the Ultra Satin Lip formula the most. Now, I don't think the Ultra Matte Lips are so drying that I can't wear them for long hours (because I have and it's been fine), but it's not as comfortable as their Ultra Satin formula. Between Dopey and Calypso, I noticed that they pretty much both lasted the same amount of time and there wasn't any discrepancy of the formula. They never felt like they were too drying or uncomfortable! It's really remarkable. Viper is a pretty color but not as comfortable to wear as Dopey or Calypso. It is on the drier side once it sets but it's not at all irritating, so I give it a biiiiiig thumbs up! 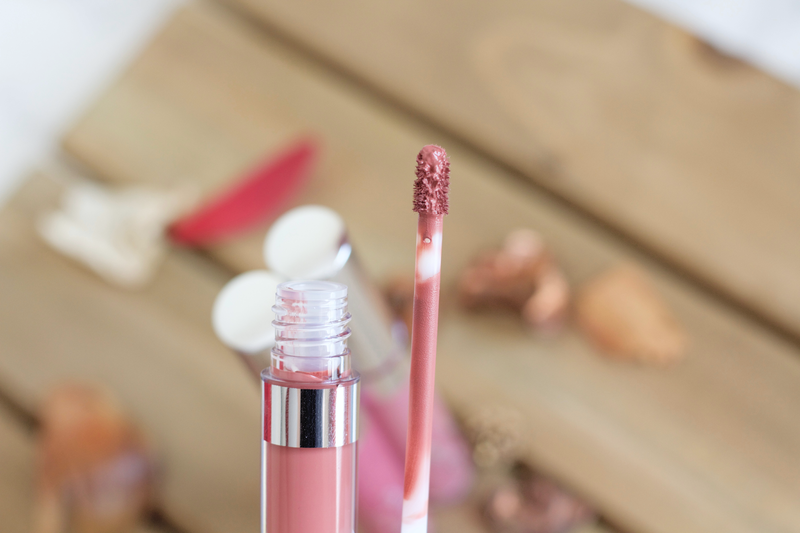 For being a matte liquid lipstick, it's one of the best I have in quality and formula. I didn't see it get into any of my fine lines or anything, so that's a plus (same with the satin formula!). I'm going to try the new ones I ordered and compare the formula and see how I do. Overall I'm happy with my purchase of all three! I look forward to trying more colors. Ingredients (Dopey): Isododecane, Diisostearyl Malate, Hydrogenated Polyisobutene, C10-18 Triglycerides, Oryza Sativa (Rice) Bran Wax, Dimethicone Crosspolymer, Pentylene Glycol, Silica Silylate, Silica, Polyethylene, Disteardimonium Hectorite, Propylene Carbonate. [+/- Blue 1 Lake (Ci 42090), Iron Oxides (Ci 77491), Iron Oxides (Ci 77492), Iron Oxides (Ci 77499), Mica (Ci 77019), Red 27 Lake (Ci 45410), Red 28 Lake (Ci 45410), Red 6 (Ci 15850), Red 7 Lake (Ci 15850), Titanium Dioxide, (Ci 77891), Yellow 5 Lake (Ci 19140), Yellow 5 Lake (Ci 19140:1), Yellow 6 Lake (Ci 15985)]. Ingredients (Calypso): Isododecane, Diisostearyl Malate, Hydrogenated Polyisobutene, C10-18 Triglycerides, Oryza Sativa (Rice) Bran Wax, Dimethicone Crosspolymer, Pentylene Glycol, Silica Silylate, Polyethylene, Disteardimonium Hectorite, Propylene Carbonate, Blue 1 Lake (Ci 42090), Iron Oxides (Ci 77491, Ci 77492, Ci 77499), Red 7 Lake (Ci 15850), Titanium Dioxide (Ci 77891). Ingredients (Viper): Isododecane, Diisopropyl Dimer Dilinoleate, Nylon-12, Trimethylsiloxysilicate, Silica, Polypropylsilsesquioxane, Disteardimonium Hectorite, Propylene Carbonate, Blue 1 Lake (Ci 42090), Iron Oxides (Ci 77492, Ci 77499), Red 7 Lake (Ci 15850), Titanium Dioxide (Ci 77891). Brady used in my crease and lower lash line, and Muse on my lid sprayed with Fix+. My eyelashes (Fleur de Force x Eylure Love Lashes) started coming off but I didn't realize until I took I looked at the pictures afterward! :( complete breakdown of my look is on my Instagram. I've really been impressed by Colourpop and these products! I actually put in another order about a week after I received these because I want to try more from them. The best news recently came out for international customers! Colourpop will be offering free shipping internationally if you buy over $50 in products! If you buy less, it will cost $9.99, which is still a steal! This campaign will go until the end of the year. They really are hearing out the complaints from people and I'm glad that they did this. Also, domestic customers get free shipping if you spend $30 or more. I highly recommend picking things up before the year ends (you've got a lot of time!). 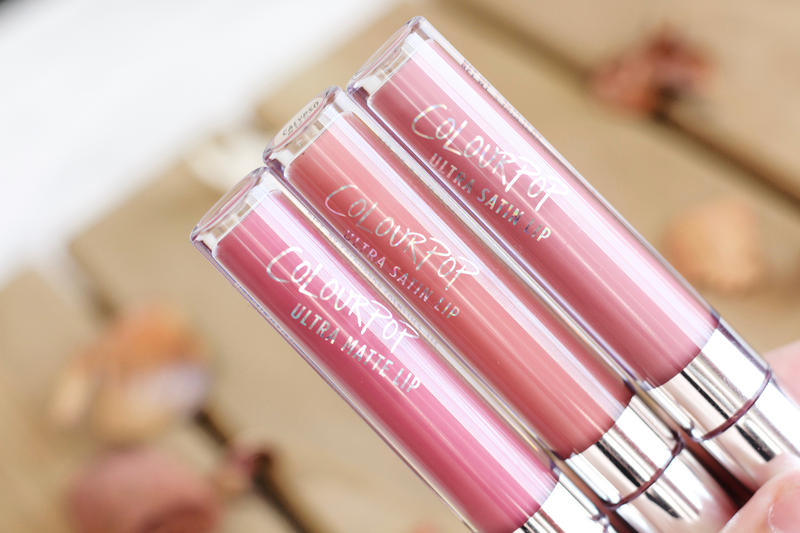 Do you own anything from Colourpop? What are your favorite products?